Many women find themselves scattered in every direction. Journaling with the use of a wellness wheel aids in bringing back balance. I have studied many forms and designed a wheel, which I use in the journaling workshop that I teach. The nine aspects of wellness (physical, emotional, spiritual, environmental, vocational, economic, cultural, intellectual and social) are all critical to a healthy mind, body, and spirit. When they are in balance, then the “center” in which we find Self, Family, Community, and World is also balanced. The use of a starburst reminds participants in the workshop that, when we come to center, our inner Light shines brightly. Balancing the aspects of our life helps us to illuminate our relationships with those closest to us (Family), those around us (Community), and those beyond us (World). Using a wellness wheel is not unusual or new. 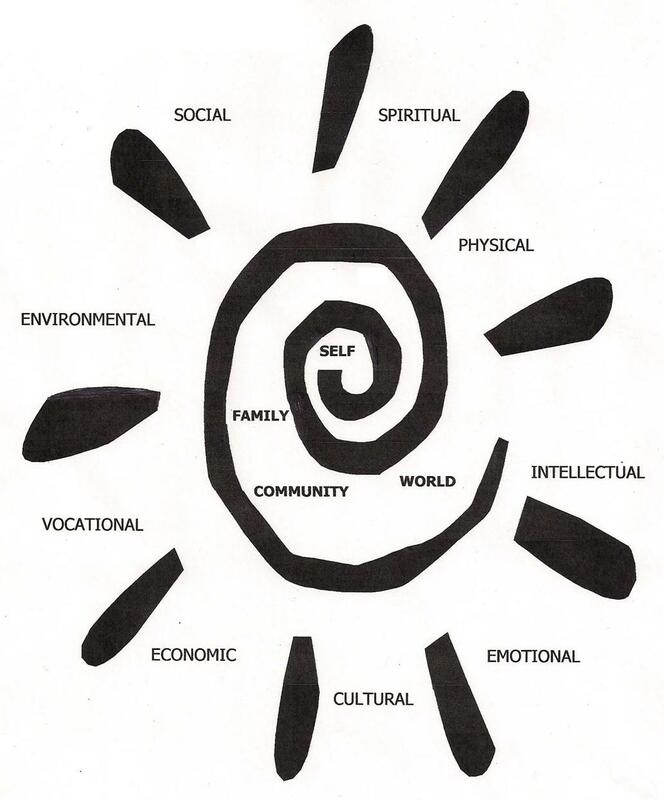 Many indigenous peoples hold the wheel, circle, and spiral as sacred. The wheel, circle or spiral explained everything from the change of the seasons to the cycle of birth to death. Using a wheel for wellness helps us to understand how all aspects of life connect to and influence each other. In addition, being able to see that the mind, body and spirit are intricately interconnected allows for balance. Too often, we are stuck obsessing about our physical bodies, totally neglecting our minds and spirit. Is it any wonder that we feel ill, or stressed all the time? By mindfully journaling on a specific aspect, we are able to discern issues that are plaguing us; recall incidents that fill us with emotion; and discover new insight into situations. In the workshops, participants use various readings, quotes, and artwork to help inspire their writing on each aspect. For instance, quotes like, “And forget not that the earth delights to feel your bare feet and the winds long to play with your hair,” by the poet, Kahlil Gibran can inspire discussion on how we view our bodies, especially our hair (often called a woman’s crowning glory) and our feet. Think of all the damage done to woman through the image of Cinderella’s stepsisters trying on the glass slipper. Women with big feet always feel self-conscious. Subsequently, we might never think that our fears, stresses, misconceptions or illnesses relate to something as simple as how we feel in our own skins. Journal writing is rewarding for other reasons, also. Often, at the end of the workshop, participants find they have the workings of a memoir or have the beginnings of short stories and poems. The ability to focus on our selves, something women have a difficult time doing, allows us to uncover the glorious beings that linger within us all. Thoreau wrote, “Good for the body is the work of the body, good for the soul the work of the soul, and good for either the work of the other.” Journaling is good for mind, body and soul. Linda M. Rhinehart Neas is a writer/educator who has written extensively in various venues, publishing and performing her work throughout New England. 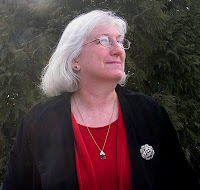 Her first complete book of poems, Winter of the Soul, was published in February 2008. Gogo’s Dream: Discovering Swaziland, a collection of poems dedicated to those who work to aid the peoples of Swaziland was published this year. All proceeds from the sale of Gogo’s Dream go directly to Possible Dreams International. Linda is also a WOW! Women on Writing Classroom instructor. Her interactive workshop JOURNALING FOR HOLISTIC WELLNESS starts Monday, April 4th. This class is limited to 10 students, so make sure you reserve your spot today. Click here to sign up now! Great post! I usually think of journaling as a way to keep track of ideas, but the great thing about journaling is that there isn't a right or wrong way. I love that in a journal you can write anything and no one is going to see it. How do you feel about blogs as a form of public journaling? This post in and of itself is really centering. I love the suggestions - definitely favoriting this one. Thank you! The wheel graphic ties it all together so well! When I first learned that I could add a visual element to journalling, so many doors opened to link everything together. Again, thanks for this post! @Miss Good...I enjoy blogging as a form of public journaling. Admittedly, some are better than others, however, I believe being able to see the difference helps us develop our language skills. @Cayla...Glad you found the suggestions helpful! @Patricia Anne...You are so welcome! Thanks for your comments. Love your wheel--so much better than the boring ol' pie slices:) Also love that the Self is at the center. Too many women have been taught that placing our Self in the center is selfish. This social meme is a root cause for depression and other disorders. Until (or unless) the Self is honored the other aspects of life will remain out of balance. Thanks for a refreshing post! I love journaling because I find that writing helps me clarify my thoughts, for all areas of my life. It does help me think about issues and my own feelings about them. @Robyn...You are very welcome! You are so right about women not putting themselves in the center. We must honor self first or we run out of creativity, energy and health. @Andrea...thanks for your comments, I hope you consider joining the workshop. Journaling on the aspects is truly enlightening!